Enjoy a Lunch for Two in Trump’s Bar , with views across the 18th green and out to the Atlantic. Darby’s Bar encapsulates the prevalent style of Doonbeg Lodge – relaxed, warm Irish ambience mixed with New England panache. 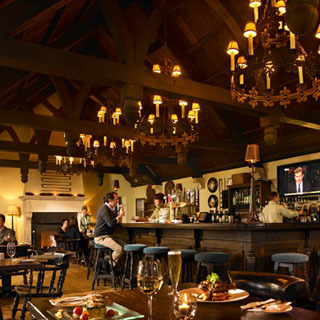 A low-lit, chattering atmosphere welcomes guests and golfers to fireside tables and a friendly face behind the bar. Set along 1.5 picturesque miles of beach near the tiny parish of Doonbeg, Co. Clare, Trump International Golf Links & Hotel is one of Ireland’s most prestigious hotel, spa and golf destinations. Use this gift voucher on AllGifts.ie to make a booking for the Trump's Bar & Restaurant at Trump International Golf Links & Hotel, Doonbeg, Co. Clare, choosing from the menu up the value of €70.